I had my eye on a Printrbot Simple, but luckily waited just long enough for the new metal version to come out. They say that the build was of moderate difficulty. I’m an experienced maker in a lot of ways, and it was mostly easy but I wasted a fair bit of time figuring a few things out. The instruction manual is done solely in pictures. This works okay in most if you are used to looking at pictures and figuring them out, but if you don’t, it can be hard. It would have been nice to have a page that detailed all the screws and small hardware from a size perspective. I spent a lot of time differentiating between the different lengths and sizes of screws. In step 5, the wires had too much solder in places, so I had to bend them tight towards each other to get the nut off. In step 7, it’s fairly clear how to put the belt on, but there’s no data around how tight it should be. In step 13, the hole for the proximity detector was slightly too small; I had to screw it in. This would make tuning it later harder. In step 14, it’s not clear how tight the tension should be. In step 16, the z-axis block was slightly too wide, so the screws didn’t line up with the holes in the stepper frame. I machined a little of the plastic away with a dremel and it worked fine. In step 19, it would be good to understand the tension level. In step 22, it would be great to have a list of all the wires that need to be bundled here. Step 24, there’s no way all of those wires will fit through the grommet. I got two of the 5 connectors through, and could get no more. I ended up cutting the grommet. Step 26, it would be great to know how long each wire bundle should be to permit full travel. Step 27, it’s really hard to see how the stepper cables should be connected, and it would be nice to have a description of which motors are X/Y/Z/E. Then it’s onto the setup. This was quite a bit more frustrating than the build was. I got the teensy driver (windows) and repertier-host installed easily. Then, it got difficult. My power supply died the second time I plugged it in. Luckily, I had an exact replacement on hand. It would be really nice to have a quicker way to set up the values for Repertier and Slic3r. This takes a while and it’s easy to mess up. The print size is specified as 200mm and the center as 100mm, when the correct values are 150mm and 75mm. Repertier won’t talk to the system until you hit OK in the manual controls part. Use the manual X/Y/Z controls to verify that the steppers move, and that they move in the right direction. For example, if you press the “Z+” button, the extruder assembly should move up, and “Z-“ should move it down. This allows you to verify that the Z stepper is hooked up correctly. This should be done for each axis. Type “G28 X” and hit “run” (or execute, or whatever it says). The print bed should smoothly move all the way to the right, and then move back until it is centered. If there is any clunking sound, the X limit switch is not connected or not working. If the bed moves to the left, the X stepper connector is backwards. Type “G28 Y”, and hit “run”. The extruder assembly should smoothly move all of the way back, and then move forward until it is centered on the print bed. If there is any clunking sound, the Y limit switch is not connected or not working. If the bed moves all the way to the front instead of to the back, the Y stepper connector is backwards. Type “G28 Z”, and hit “run”. The extruder should smoothly move down until it is close to the bed. Better directions to set up the Z offset would really help. I watched the video on setting up the auto-leveling bed. I understood the concept, but there really needs to be a guide for it. I’ve done a few prints with the printer, and it has performed quite well. Overall, I’m quite pleased. Five or seven years ago, I started riding with the Eastside tours group. We ride Tuesday and Thursday nights all over the east side, and we climb a lot of hills. A couple of years ago, I was lucky enough to inherit the leadership of the group from Per Sunde. I’ve learned a lot about the hills on the east side during this time. In my spare time, I run a website – BicycleClimbs.com – that show the different ways up those hills. I’ve decided to share that information through a series of posts that talk about a hill and the different ways that you can climb it. If you want to know the easiest way up, I’ll show you that, and I’ll also show you the harder ways. I’ve ridden up pretty much all of the routes I’ll show; if I haven’t I’ll let you know. Since I’m hoping it will be educational, I’m starting with Education Hill north of Redmond. Education hill is the hill directly north of Redmond. It is named because of the number of schools that it contains. The easy traditional way up the hill is from the west [A], starting near 60 acres. This climb starts with a very steep (15% or so) section right at the beginning (okay, so it’s not that easy), and then is a mostly easy climb except for the last little pitch near the top. This climb is featured on the 7 hills metric century ride. There’s a nicer option [B] that starts at 124th and avoids the steep climb at the beginning. It tends to have a bit less traffic, but the road has a few deep grooves in it, so pay attention. 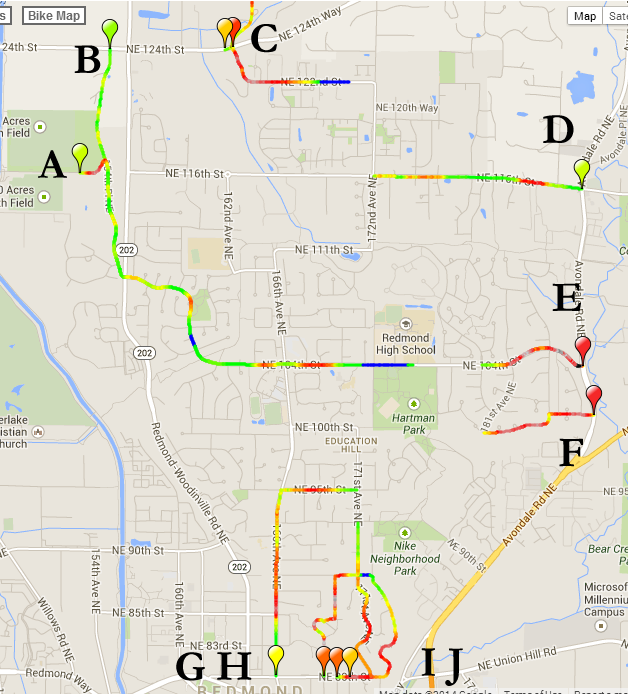 From the east, NE 116th St [D] is the easiest way up, and is also featured on the 7 hills metric century. It has a couple of steep sections but isn’t too bad. That’s it for the easy ways up. The other options are harder. If you head east on 124th, you can turn tight and climb up 162nd Pl SE [C]. This is a steep climb, peaking at around 15%, but is pretty good from a traffic standpoint. From the east, there are two harder ways up. The first is 104th [E], which is really steep – a sustained pitch in the 15% range, and it has a lot of traffic. It does feature a bike lane, but I don’t think you are going to enjoy it, and I don’t recommend it. Just to the south off of Avondale, there is the Hidden Ridge Trail [F]that cuts into the neighborhoods to a nicer climb. Still quite steep, but with less traffic and a bit more rolling; this is a much nicer way to the top. From the south there are a few options. The westernmost one is 166th Ave NE [G]. This is a two lane road without any shoulder, so I wouldn’t recommend it unless it’s a really quiet time from a traffic sense. A bit two the east, there are three options. 171st [I] and 172nd [J] Aves NE both start with a steep pitch on NE 80th, and then both turn north and run parallel to each other. I think 172nd is a bit easier, though ask me tomorrow and my answer may change. 171st has a bike lane, while 172nd doesn’t, but 172nd has less traffic. Both peak at perhaps 11%. A climb through a new development just to the west of these, 169th [H] offers a route that gets steep and flattens repeatedly. The maximum gradient is around 14%. The easy ways down work fine when descending east or west. I do not recommend descending 104th to the east; it’s super-steep, it ends at a stoplight, and there is sometimes a bit of grit on the road. Either take the hidden ridge trail, or head down 116th. Heading to the south, 166th is a nice way down; just beware the stoplight right at the bottom of the hill.